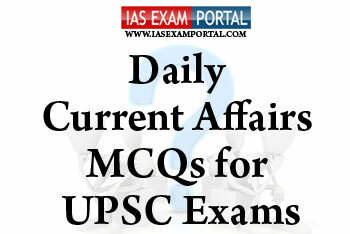 Current Affairs MCQ for UPSC Exams - 03 FEBRUARY 2019 | IAS EXAM PORTAL - India's Largest Community for UPSC Exam Aspirants. Q1. Consider the following statements regarding current Inflation status in India ? 1) Retail inflation for industrial workers increased to 5.24 per cent in December 2018 as compared to 4 per cent in the year-ago period. 2) While India’s Monetary Policy Committee has been cautioning about upside risks to inflation, actual readings have been below expectations for the last few months. 3) Inflation-adjusted interest rates in India are already the highest in Asia, an indicator of policy tightness. Q2. The shrinking of the Aral Sea has been called "one of the planet's worst environmental disasters".Formerly the fourth-largest lake in the world with an area of 68,000 km^2(26,300 sq mi), the Aral Sea has been shrinking since the 1960s after the rivers that fed it were diverted by Soviet irrigation projects. The Aral sea lies between which of the following Central Asian countries? Q3. Which of the following statements regarding “Mera Gaon-Mera Gaurav” scheme are true ? 1) Under this scheme, groups of scientists will select villages and will remain in touch with that village and provide information to farmers on technical and other related aspects through personal visits or through telecommunication. 2) The scheme enables 20,000 scientists of National Agricultural Research and Education System (NARES) to work directly in villages. 3) The scheme is being implemented by Council for Scientific and Industrial Research (CSIR),Chennai. Q4. Which of the following statements with respect to microbial fuel cells are true ? 1) A microbial fuel cell (MFC) is a bio-electrochemical system that drives an electric current by using bacteria and mimicking bacterial interactions found in nature. 2) MFCs are attractive for power generation applications that require only low power, but where replacing batteries may be impractical, such as wireless sensor networks. 3) They find application in waste water treatment and in long term medical applications like pacemakers. Q5. Which of the following is the first state in India to set up a price monitoring and research unit (PMRU) to track violation of prices of essential drugs and medical devices under the Drugs Price Control Order (DPCO) ?